Learn to Wakeboard or develop your existing skills on our Wakeboarding Holidays. We wakeboard every morning (weather permitting). 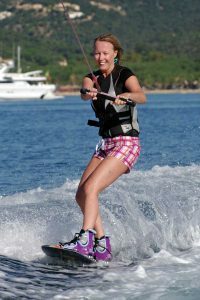 We also provide Wake Skating as an activity in our watersports holidays. 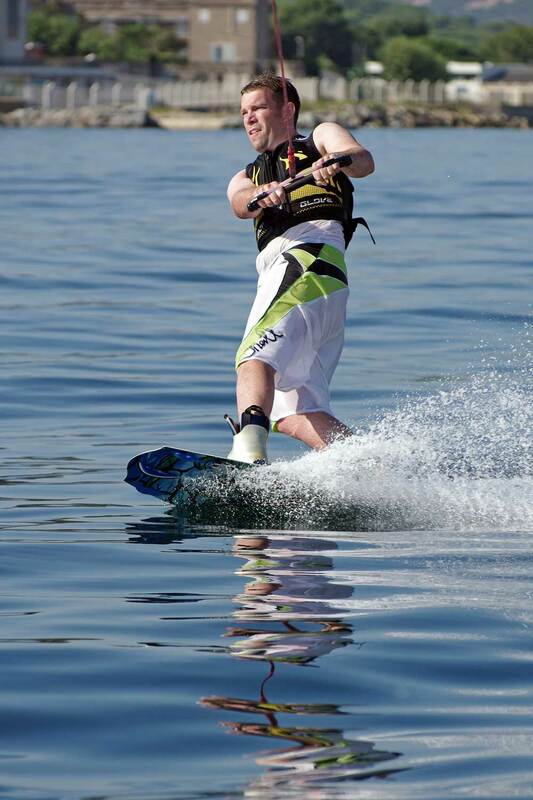 Wakeboarding is one of the coolest water based board sports there is. 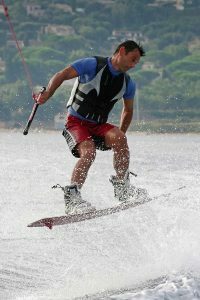 It is a great carving and jumping watersport with good scope for expression. It has similarities to snowboarding, skateboarding and surfing, with good crossover skills. So if you snowboard, skateboard or surf you will be right on it. 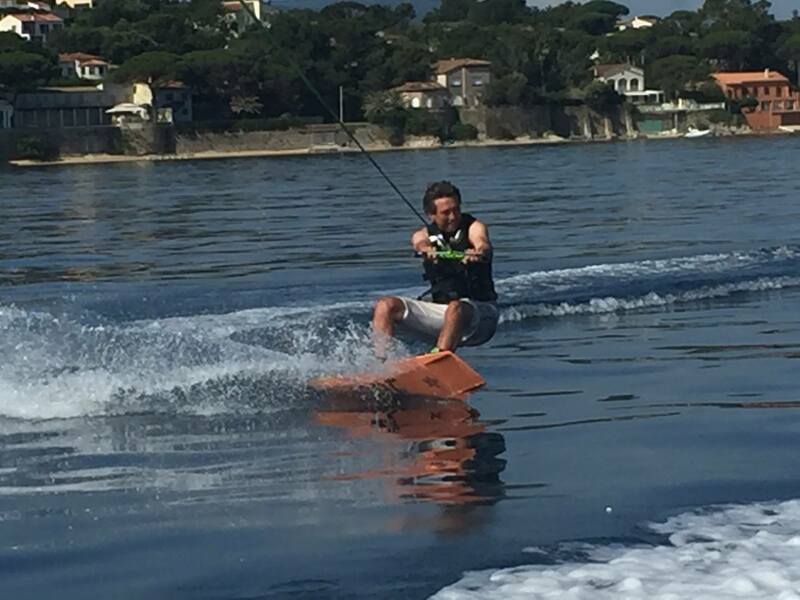 All the staff of Adventure St.Tropez are keen wakeboarders and the pictures (all genuinely ours) show some of our Instructors and guests enjoying themselves. Wakeboarding is one of the watersports that we teach at Adventure St.Tropez and is our favourite. You will find an enthusiastic bunch of guys delighted to share their passion for the sport. A great many of our customers are beginners but we can equally advance intermediates. We are down to earth, qualified teachers with a lot of experience and patience. Being vocational teachers we love to see you succeed. 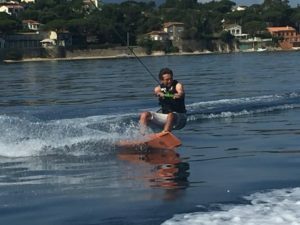 If you are keen to spend a big part of your holiday learning to wakeboard in the warmth of the Mediterranean sea you will love a holiday with us. Our wakeboard boat is moored just a few metres away from the accommodation, so it’s great to be able to wake up and walk down to the pontoon for your morning set. 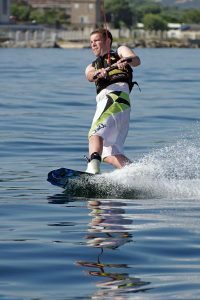 No need for wetsuits and the sun and warm waters make all the difference to your successful wakeboarding and watersports holiday. Our wakeboard boat has a full Monster tower and produces a good wake. It’s also a good sea boat with a “deep V” hull and great manoeuvrability. PLEASE NOTE: The Gulf of St.Tropez, whilst warm and sheltered, is still the sea and not a lake. We do not have exclusive use of it. 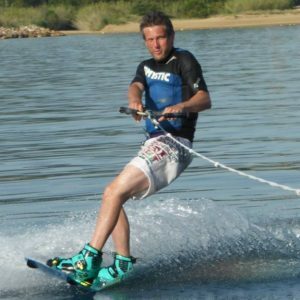 We provide Wakeboarding Holidays, not an intensive course and we are friendly, qualified, experienced wakeboarding teachers but not national team coaches. Our wakeboard boat is a good all-round sea going craft with a Monster Tower and a good wake. It is not a lake tournament boat. We have had some seriously good wakeboarders here and a lot of beginners and intermediates. We hope you will join us. We love our wakeboarding and watersports.